Great Grill Giveaway (Just In Time For Father’s Day)! Check out our great grill giveaway today. 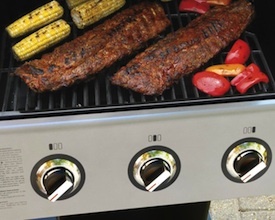 Now, wouldn’t you just be the apple of Dad’s eye if you won this great grill for your Pops? (We know, he always liked you best anyway, so you don’t really need the extra points!) Sears.com is the place to go for grills this season, so if your grill (or Dad’s) has seen better days, head over to Sears.com to browse their selection. When you’ve picked out your perfect grill, use the promotional code GRILLS20 when you check out online—you’ll get a cool $20 off the cost of your hot, new grill. Note that this discount does not apply to Weber grills, but all others are fair game! And now for the giveaway! 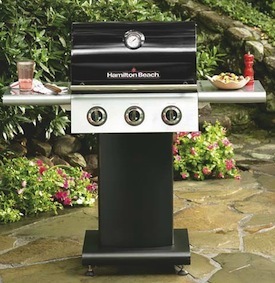 We’ve got one Hamilton Beach grill to give away to an AFH fan, and it’s a beauty (regular retail value of $399)! To enter, first “Like” AFH on Facebook AND also “Like Sears on Facebook” , too. Then leave a message below telling us what you’d like to cook for Dad on your new grill. Good Luck! (Winner must reside in the Continental US.) All AFH terms and conditions apply. if I won this one, it would definitely go to my hubby, the most awesome Dad I know. He works 60+ hrs a week and the last thing he wants to do is start up the charcoal grill at 9 o’clock at night when he gets home for BBQ…he would love the convenience of a gas grill! I would love to cook some griiled Mahi Mahi with a fresh fruit salsa, over a bed of yummy garden greens!!! Yum-O! Thanks for the opportunity! 🙂 Happy Father’s Day to all the important men out there! I’d be giving this to my husband as well, and I’d grill up a huge batch of carne asada and fresh tortillas! YUM! I would love to grill salmon and fresh vegetables for Dad. Happy Father’s Day to all! I like you and Sears on Facebook. I would love to make my dad some venison burgers on the new grill. For me, I would LOVE a grilled portabello burger. I am thinking tequila lime shrimp kabobs and hoisen salmon burgers. Of course a nice steak is yummy too. i would love to have this so i can grill chili paste chicken & flank steak! My father is about to come move to the US from Lebanon to be closer to his grandchildren. What better way than to welcome him into the US with this new grill! Knowing him, he would probably use it to grill tomatoes, onions, chicken and steak kabobs. I Like you both on Facebook (Steph E.) and I would cook my dad classic burgers and hotdogs. LIke both on FB (Kim McH). I would cook some salmon on the grill. Some shrimp and scallops would be amazing!! Awesome Giveaway! I would like to cook my dad a steak, because he loves them. I like you both on FB! If we won we would be grilling up some steak kabobs! Of course we would have fresh pineapple on those:) There is just something about grilled pineapple that is just to die for! We are a family that loves hamburgers. We would cook some with cheese and some plain and even a veggie burger. All good! My old grill was demolished during hurricane Irene last summer – I could really use this. I would love to cook a great steak and some veggies for my dad that is what he loves! Chicken and lots of veggies!! Liked both on Facebook. for hubby would have to be steak! I would love to cook some cauliflower and some veggie burger shrimp and steak my dad would love this grill!!!! My husband has been the most amazing husband and father anyone could ask for. I was diagnosed with Behcets Syndrome in 2005 and he has had to take on the role of mom and dad since I have been sick. He works 3rd shift, goes to school full time to become a teacher plus takes care of me and out 2 kids. This would be the most amazing gift. I wouldn’t be able to afford to get him one since I am unable to work. This would come in very handy for those nights he wants to be outside grilling to have some quite time to himself. He would grill some chicken and tons of veggies!! Steak, pork ribs, red bell pepper, onions, corn, pineapple. Heck maybe even a pizza! I love to grill! I would love to grill some nice juicy ribs. Never have enough room on our tiny grill with such a large family, but Ribs are our favorite so looking forward to cooking massive amounts of ribs if I win this grill. Thank you for the opportunity! My husband does all of the grilling in our family. As much as I appreciate it, I really do think he loves to be in charge of the grill–so, I won’t be cooking anything for him on Sunday. My husband loves to grill steak and ribs; and, he makes really delicious grilled vegetables. Liked and shared. What a cool gift!! I would love to cook a side of baby back ribs and some roasted corn for Dad on the grill. I like your site and also Sears. I would grill a nice thick steak, backed potato, corn on the cob and bacon wrapped jalapeno poppers. YUMMY!! I’d grill shrimp & vegetable skewers with grilled pineapple and banana for dessert! My Dad is 91 years old and in a nursing home. I actually just got a phone call from there while I was typing this. He isn’t doing so well tonight. I can’t BBQ for him but I would love the BBQ so I could cook for the Dad of my two sons. 🙂 Steaks would be wonderful. COOL giveaway. I “Liked” AFH on Facebook AND also Sears! I would love to cook some 1″ think rib eyes with grilled asparagus and peppers on the side 🙂 and grilled peaches with homemade ice cream for dessert! My dad was just talking about the fact that he needs a new grill! I would make him some grilled chicken kebabs!! Like both on FB. I would like to cook my prize winning Mediterranean lamb burgers. I’d grill fish or chicken, but what I’m really wanting to try is grilled pineapple & pears! I lost my Dad eight years ago but if he was still here with me I’d love to cook him his favorite, ribs on the grill! I would cook a big juicy steak, grilled potatoes, corn on the cob and garlic bread. All on the grill for Father’s day! Our family bought a camper last year we are learning to cook all our meals on the grill. A new one would allow us to try new receipes and spend more time together as a family. I’m sure I could find some fancy recipes to grill up, but my dad’s favorite is always going to be a big, juicy steak! I would load it up with vegetables and a pork tenderloin. My husband would love to have grilled trout and roasted corn on the cob. I would love to win this grill and fix this meal on it. Even if a win is not in my future, I will still try to do my best on our old grill because he really is a great dad. Thank you for offering such a nice prize and for having the contest. Marinated T-bone steaks, teriyaki mini peppers and grilled potato slices. Yum! With lots of fresh veggies. I’d cook up some of everything — some steak, some chicken, lots of veggies, and maybe try grilling fish. We’ve never done that! Already like both on Facebook. 🙂 This would go to my hard working military husband. We lost our grill in a house fire last year, would be awesome to surprise him with this for Father’s Day! First thing we would cook RIBS. I would grill ribs for my husband because he loves them. He is an amazing dad! I’ll grill some steak kabobs and then some pineapple slices for desert! Yum! Happy Father’s Day to all the dads! I would love to grill for my husband since our grill is broken. I’d make all his favorites…lobster tails, shrimp, steak, potatoes and corn on the cob! I’m getting hungry! My Father-in-Law would be so surprised to get this grill for Father’s Day! I’d make him a gourmet meal of grilled halibut, an array of veggies and anything else his heart desires! Thanks for everything!! I would love to cook some copper river salmon on this fabulous grill. Thanks. I would like to cook up some pork chops, sweet corn and bakes beans on the side burner also Nancy S sent me. I would grill homemade pizza for DAD! for that special day for my dad, this is what i have planned. Balsamic marinated chicken breasts, slowly grilled to perfection, Grilled corn on the cob with chipotle lime butter and baked ranch fries. Dessert will be fresh berries and vanilla yogurt. Of course I have some cold Fat Tire beer that is his favorite. My dad loves ham steaks on the grill. I liked both pages on FB. I would grill my dad my famous Teryaki Tenderloin with grilled pineapple. ps. I really need a new grill. On the grill: Salmon Kabobs (Omega-3’s!!!!) and Red Peppers! On the side I would whip up a little Greek yogurt and cucumber dip! I have to admitt that the picture inspired me, I’d have to make him some BBQ ribs! Ohh he’d just LOVE that. would really love a new grill for all my summer grilling (there is no “dad” to celebrate FD with). fb fan- and I would love to grill some salmon but he also does great steaks too! Would love to grill some nice polenta and grilled veggies…MMMMMMMMMMMMMMMmmmmmmmmmmmmm!!!!! I would grill him a nice juicy steak! RIBS!! or WINGS!! My dad loves both and loves to grill! would love to grill some spicy and yoghurt marinated chicken wings! I would love to cook my husband, my dad and my father-in-law a locally raised dry-aged steak with grilled veggie kabobs and sweet potatoes and grilled pineapple for dessert! Yumm! Like both on fb as Michelle Trump, and I am thinking I would love to make beef kabobs and corn on the cob. Wow! We have no grill so I dream about making grilled salmon with asparagus and mango salsa. I dream about healthy veggies on the grill and burgers with fresh tomatoes and cilantro from the garden. I would love to grill fresh fish that I can buy from the market and dress it up with basil, garlic and dill! I want to wrap corn on the cob and grill it as well then make declicious salads. I would be grilling all summer! It’s heart-healthy! We are late night eaters and could really use a gas grill. We like to make something healthy for us and our dogs. We have no air conditioning and hate heating up our stove to make it even hotter! I’d grill my dad steak and river potatoes. I’ll be cooking Dad a steak wrapped in bacon. That is what he likes, and that is what he is going to get. He will be so happy! I will be cooking bacon wrapped steak. That is what he likes and that is what he is going to get. I would grill marinated chicken and veggies for my spouse; he is a wonderful husband and great Dad. I would make him a paella on the grill. Pork, chicken, seafood, saffron broth, artichokes, lima beans, sofrito, and Valencian rice, all perfectly cooked the way a paella is traditionally prepared, outside! I liked you both on fb. I would grill him up what ever he wants, it’s his day and he deserves nothing but the best.. And a new grill would top it all off.. I would make him Pork Country Ribs and corn on the cob. They are his favorite. Haven’t made them for a few years since the BBQ broke. Ribs for my grand daughter, And potatoes in foil with lots of roasted seasoned veggies. I would grill veggie kabobs! My dad is on a healthy heart diet after surgery and this would make his day! I would cook my dad a whole roaster chicken! I’d make him chili pineapple shrimp skewers! This grill would replace the current broken one. If I win this grill I would make my dad (who is a retired police officer) some jerked ribs, jerked chicken and pepper shrim. I would cook him all of our local island favorites right in TX. I would love to win this for my husband. He deserves it! I would grill chicken breasts stuffed with arugula and goat cheese. And grill some strawberries on the side for dessert, served with homemade whipped cream. Thank you for the opportunity! I’d cook my dad grilled tofu with tons of grilled vegetables and finish off with some grilled fruit! My Dad would so love this!!!! This is a great bbq! I would love to grill fresh veggies and fish on this! I would love to win this grill for my husband! He is a wonderful father and deserves everything life can offer him!! I would make him Filet mignon, chicken Kabobs and tons of fresh grilled veggies!!! Like both on facebook and would LOVE to win!! Thank for the chance to WIN! *I* personally do not grill, but my husband soes & enjoys it, so he would grill up his own dinner 🙂 and we would most likely choose Salmon, or Shrinp Kabobs! Thanks again! This grill looks awesome. Just what is needed to grill some shishkebabs, and maybe some corn on the cob! I would grill up some steak and shrimp! I would give this grill to my husband and have him grill up some salmon on a cedar plank and pineapple slices. Or our other favorite, marinated flank steak! I like both on facebook already! I would love to grill steak and corn on the cob! I also would love to try to grilled peaches! This would be an awesome present for my husband (who is also a father & grandfather). He loves steak, corn on the cob, and baked potatoes……which would be the perfect “Father’s Day” meal for him. This would be an awesome gift for my husband (who is also a father and grandfather). His favorite meal is steak, corn-on-the-cob, and baked potatoe …….which would be the perfect “Father’s Day” meal to serve him. I would love to cook my Husband a wonderful piece of Salmon on a rosemary plank, some bi-colored corn, and red potato salad, and an ice cold beer. Because with a grill like that, all a man needs is his beer, cooking utensils, and family. Desert would be his favorite cheesecake with fresh strawberries. Kabobs are a family favorite…steak, chicken, or shrimp with veggies. This would be ideal for us since our grill has been used so much it’s ready to retire. My dad’s grill bit the dust at the end of last summer and this would be a great surprise for him. I would love to grill him pork steak, onions, and fresh picked squash from his garden. I would grill garlic chicken, roast peppers, onions & red potatoes. My Daddy instilled in me a deep and utter love of hot dogs! In my family hot dogs are a summer tradition. There may be folks who are excited to fire up steaks and chicken and other grill-a-riffic fare, but my father and I would love an almost burnt hot dog beyond anything else grill worthy. Thanks for the opportunity to win this for my family. Would love to start sharing some barbeque ribs with neighbors. My daddy (yes, I am 37 and STILL call him daddy), suffered a heart attack and underwent a quintuplt bypass. Besides just being thankful to have him here for another fathers day, I will grill him something amazing like Salmon prepared with just a little dill and lemon. I will also grill him fresh veggies. We love grilling Shish Ka-Bobs!! Yum! I would grill steaks. It’s a beautiful grill. Nancy S. sent me. Kabobs (lean steak, red potatoes, bell peppers, onions and mushrooms) marinated in olive oil and balsamic vinegar. I would cook on this grill. Nancy S. sent me. Awesome giveaway, and my dad could totally use a grill right now after we found a wasp nest in ours over Memorial Day weekend and my brothers came up with a less than successful way to deal with it. It was time to get a new one, but the old one still had some life in it till they decided to dewasp it. I would love to make a grilled Salmon on a rosemary plank, some bi-colored corn, red potato salad, and some fresh strawberries and cheesecake. Of course, my man would have to be grilling with his official grilling outfit, his sacred utensils, and a cold beer in hand. Liked both pages. It was so great to see all of your comments! Some of you are really creative with what you would like to BBQ for your dad, husband and significant others. Wish we had lots more grills to giveaway! Our winner is Michelle B! Michelle, I will be sending you a personal email to let you know what information is needed to claim this great prize for your hubby! To all the dads out there who are special to all of you have a great Father’s Day and enjoy whatever you do! Liked both on FB as Amber Gillespie. I would like to roast my father some of my home grown veggies on the grill, along with some hamburgers made from my co-worker’s beef. Thanks from karmakaytlyn@yahoo.com! Lets get out and do some grilling. Dont see an end date on this so will take a chance and still enter as this is a beautiful grill! Liked you on FB! Like Sears on FB! My dad has passed away, so would probably keep this grill as I do not have one, or maybe give it to my daughter who is starting over… The first thing I would grill would definitely be salmon fillets and a baskets of mixed veggies and fruits! A nice ribeye with some grilled corn and potatoes!